Dealing with a pantry moth problem? Get rid of these pests once and for all without resorting to toxic sprays or chemicals. First, depending on your situation, just using a Pantry Moth Trap (note: use only one trap per area!) may be sufficient, but if you have a really horrendous infestation of moths, you may need to try some different things. We'll share our best tips for getting rid of a moth problem, as well as what we do in our own home to prevent future infestations. Remove all infested food items and throw them away OUTSIDE (don’t leave near your doorway) in a sealed trash can or bag. We know this is hard to do—but in order to prevent further infestation, you need to force yourself! Vacuum out cupboards, empty vacuum bag outside and discard into a sealed trash can or bag. Clean your cupboards and shelves thoroughly with warm, soapy water and dry well. Then spray with a strong vinegar solution (add essential oils if you like—see recipe below). When doing this, be sure to get the liquid into the cracks and crevices as these are the areas moths tend to lay their eggs. This is a very important step in stopping future eggs from hatching. **If using essential oils, mix 4 oz vinegar with 1/2 tsp Eucalyptus and Lemon essential oils and 1/4 tsp Peppermint or Lavender essential oil. Place one pantry moth trap in your pantry and change out as needed or every 60 days. Using more than one moth trap per area is not recommended, as it decreases the effectiveness of the pheromone traps, "confusing" the moths. Keep 1-3 bay leaves in each container of dried goods as a deterrent. At our house, we use three leaves and place one at the top, one in the middle and one at the bottom of each container. 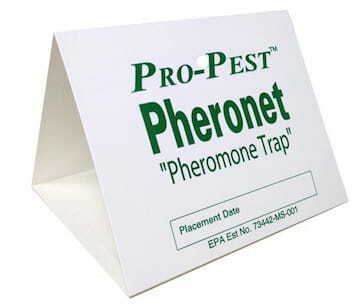 To shop for pantry moth traps, click here!